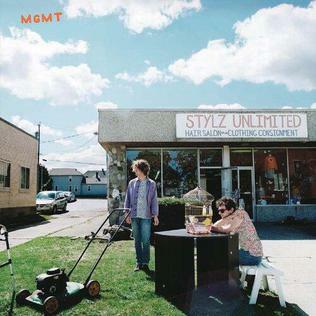 Trying to define MGMT’s signature sound is like trying to find a four-leaf clover in a field of green: it will take you forever and give you a major headache. Their latest eponymous third studio album doesn’t help with their classification due to its vast difference from their previous efforts because of its sheer strangeness. MGMT decided to release the weirdest album in recent memory. From the opening soundscape of “Alien Days” to the last song opus of “An Orphan of Fortune,” the band’s polarizing new sound challenges listeners to decide whether they love it or hate it. This album definitely isn’t for listeners who were hoping for another catchy song like “Kids” or “Time to Pretend”. While the album itself is memorable, it’s not about the singles. None of the tracks really stick out or are catchy enough to find yourself humming them and for the most part they somewhat meld together. The first single, “Your Life is a Lie,” probably comes closest to standing out, along with “Plenty of Girls in the Sea,” the individual songs on the whole are remarkably forgettable. What isn’t forgettable is the album in its entirety; it’s an album meant to be listened to all at once. MGMT manages to evoke the glory days where vinyl records were be played in one sitting instead of picked apart song by song to find a gem. It follows suit with the progressive rock bands that would make an entire album from one song. The whole album is a psychedelic experience meant to be taken whole. To go along with the experience, the band released what they called “The Optimizer,” a sort of lava lamp-like video to go along with the music. The Optimizer is strangely entrancing in its bizarre presentation, almost like a grotesque sideshow that’s impossible to look away from. While the recurring image of a lobster-man-crab-deer-umbrella hybrid may leave you with nightmares (and it will), it’s definitely something to sample. All in all, the album is a completely new step for MGMT, shying away from their Oracular Spectacular and Congratulations routes for a more experimental approach to music. This album is polarizing for sure, and its sheer insanity is hard to shake off, but while some may love it and some may hate it, it’s a highly ambitious project that, for me, hit the mark. The album takes a few listens before it sticks. Although the first album band was the most memorable and lovable, the third album direction they are taking is definitely something that bears watching with with keen interest. MGMT has delivered possibly the strangest album of the year, but in this case it’s not a bad thing at all. The album is quite simply an experience that is best served in its entirety.